Kanstet has great experience in design, manufacturing and installation of Portable running Tracks for top class competitions. There is a plenty of good permanent running tracks around the World. However the disadvantage of these facilities is relatively small seating capacities. 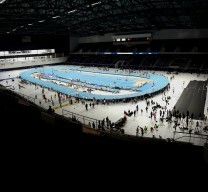 There are a lot of indoor halls with great number of seats as well but there are no Running Tracks in. Our Portable running Track is only solution to bring Track & Field into the buildings not originally intended for it. Your doubt that your building is not big enough to host IAAF Standard 200 m Running Track? Don’t worry. Please send to us just basic dimensions (length / width) for assessment and we come back to you with recommendations shortly. As an example Arena of European Indoor Championships was raised to the height of 3 meters above the building original floor. However bends span to spectator seats. Specially designed supporting frames allowed us to assemble the track over part of amphitheater. The portable infield has unic construction. Ford Center at the Star, Frisco, Dallas, TX February 2017. Ask for more information here. We want offer you hydraulic banked Track as well.